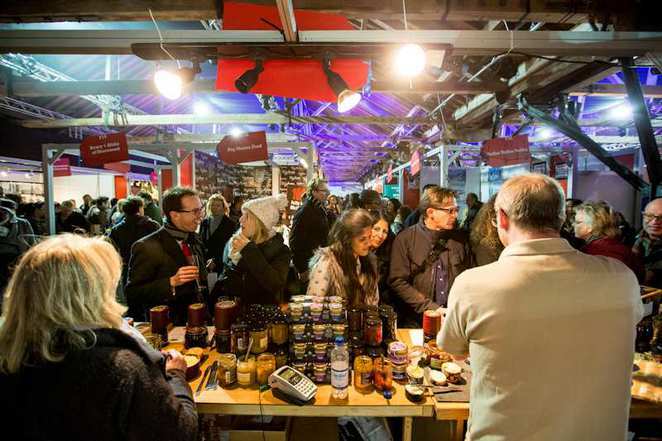 Taste of London Winter at the Tobacco Dock has been described as 'the world's greatest restaurant festival.' Although it changed its name from 'Taste of Christmas' two years ago, the festival still has that festive feel with markets full of gifts and taste sensations. The festival features masterclasses, wine, chocolate, and cheese tastings, and live demonstrations from the capital's top restaurant chefs, who will be putting twists on classic winter dishes. The festival has also introduced a new way of buying food at the event. After buying a ticket, you will be sent a Taste Club Card that needs to be activated online. You can use this to buy 'crown tokens' before the event, so when you are there, you can simply swipe your card to buy anything. Among the chefs at the event, you will find Michel Roux Jr., Raymond Blanc, Daniel Doherty, Neil Rankin, and many more. The chefs have been challenged to follow a theme for the festival: Forgotten Foods, which means that they will be using cooking techniques, skills, and ingredients not commonly used. One such example is the BBQ. Barbecues might be common in summer, but you don't see them around much in winter. Taste of London will change that as it brings out the fire pit and cooks char-grilled deer. The warm glow of the fire will bring Christmas to London, and keep you toasty warm.